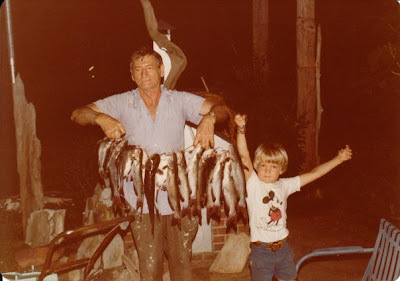 The photo above is our oldest son Walt and my father, the late Cecil Carpenter. One of my very best Christmas Eve memories is Walt's birth. Thirty-eight years ago today I was in the hospital with our new arrival. I had done the finger and toe check, handling him tentatively in my inexperience. I thought he was beautiful. It wasn’t until much, much later that I learned my brother-in-law and wife would joke that they were coming to the hospital to see “Elmer Fudd.” Well, it was true that Walt was almost bald, with just a little bit of almost silvery-blonde hair that looked like it had been drawn on with a pencil. It was a good thing that by the time I learned of the Elmer-Fudd allusion, it was funny to me. The newborn look disappeared quickly, but one thing never changed: I still think he is beautiful, inside and out! Happy Birthday Walt! Oh, and in case you are wondering what that photo has to do with Christmas, it is the only one of Walt as a child that I have access to right now in digital form, lifted from my brother Mike's Facebook album. Yesterday we added another joyful memory to our store of Christmas-season blessings. We learned that the little one our son Jeremy and his wife Katie are expecting in May is a little boy. He will be our sixth little grand-Skupien and our third little grandson. A merry Christmas indeed!